My husband & I like to joke that we are raising a candidate. 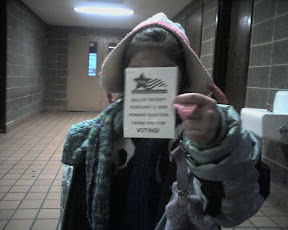 We take her with us to vote (this photo is from Super Tuesday), I've taken her to door knock for Congressional candidates, she knew the phone bank script for an Aldermanic campaign last year, and we talk to her about politicians we see on TV or in magazines. About a year and a half ago we were in a doctor's waiting room and I pointed to the cover to TIME magazine and said, "That's our next president." I was only half joking, but more seriously explained that the smiling man was our Senator. I really do view a lot of what I do in life through a feminist lens. It's not easy, but it's not cheesy either. I don't vote just because I have something to say or want someone to do something for me, but I know the history of women's suffrage and well, I am so not going to tempt the ghost Alice Paul to haunt me. I will teach our daughter that history as well as the sad facts like the disenfranchisement of ex-felons, that the changes at the Chicago Housing Authority destroyed the only "poor peoples" voting block this city knew, and that despite our huffing over democracy, that money can still buy an election. But I will certainly stress that many women fought long and hard for her to have the right to vote, that it is not something to take for granted, and certainly that she can't complain about this or that if she opts out of voting. When I think about the awesome fact that she has an opinion on whether to vote for Barack or Hillary (she wants a tie, she likes them both) AND that she is willing to voice this opinion, I have to be super proud of her. And honestly, I'm pretty proud of us as parents. Will she ever run for office? I haven't a clue. But I know that she will grow up knowing that she should always vote and that the first Presidential race that she may recall will have a white woman or a black man on the top of the ticket. We're not raising a candidate, we're raising a citizen.